The Kansas Wesleyan women’s basketball team and coach Ryan Showman knew it would be no easy task on Wednesday night as the Coyotes faced seventh-ranked Sterling at Mabee Arena. After falling behind early, the Coyotes rallied and held off several charges by the Warriors to come away with an 89-73 victory in front of a large, and boisterous crowd. “It was a great win for this team,” Showman said. “It started earlier this week in practice and it just carried over into the game. The players were ready to come win this one tonight. The results created a virtual logjam atop the conference standings as three teams, Wesleyan, Sterling and Tabor all have two losses and are in a virtual tie for first, but the Warriors and Tabor Bluejays hold a half-game lead on the Coyotes with 13 wins, since neither had had its second round bye date. Sterling (18-2, 13-2) scored the first five points of the game, but it was all Coyotes (14-6, 12-2) after that, but not without some tense moments. Haleigh Bradford (JR/Schertz, Texas)’s free throws tied the score with 7:57 to go in the first and were part of a 16-2 that gave Wesleyan a 16-7 lead with 3:51 to go in the first on a bucket by Valerie Most (SR/Brady, Neb.) who finished with a career high 10 points. The first quarter lead for the Coyotes pushed out to as many as 13, the last time on Amanda Hill (SO/Rossville, Kan.)’s bucket with 23 seconds left that made it 27-14. Maddie Miller (SR/Kiefer, Okla.)’s bucket with 5:24 left in the second quarter gave the Coyotes their biggest lead of the night at 41-19. Eleven straight points by Sterling halved Wesleyan’s lead at 41-30 with 2:34 left in the quarter before Virja Lewis (SO/Kansas City, Kan.)’ bucket stopped the Sterling run. The Coyotes took a 48-36 lead into the half. The Coyotes shot 52.9 percent in the first half and forced 14 Sterling turnovers that turned into 16 points. Bench production was huge for the Coyotes as well, with 28 first half points off the bench and finished the game getting 46 points off the bench. Sterling made things interesting in the third quarter as the Warriors turned to Kylah Comley, who poured in 15 points in the quarter as Sterling got back within four at 60-56 with 2:40 to go in the third. It seemed though every time the Coyotes needed a play, Amanda Hill was there. Hill scored seven points during the third, all coming at a pivotal point after Sterling had cut the difference to four, stopping the Warrior run with a bucket and later hitting a 3 and another field goal to push Wesleyan’s lead back out to nine at 69-60 after three quarters. It just seemed like every time we needed a basket, the ball found Amanda,” Showman said. “She cuts into the paint, boom, hit it. She got a kick out 3, boom, hit it. She just made plays for us. I couldn’t be more happy with her because I know she works so hard. Kivinski poured in 10 points in the final quarter including a huge 3-pointer with eight minutes to go that put Wesleyan up 14 and another perhaps bigger triple with just over five minutes left that put the Coyotes up 12, just moments after Sterling had cut the lead back down to nine. A three-point play by Courtney Heinen (JR/Axtell, Kan.) with 1:31 left put Wesleyan up 16 at 88-72 before one final push from Sterling got the Warriors within 10. Gabbie Miller (SR/Kiefer, Okla.)’s free throw closed the scoring. “At the end of the day our team flat out refused to lose,” Showman said. The Coyotes were 34-of-69 from the field in the game for 49.3 percent and had five reach double figures in scoring led by Hill’s season-high 15. Lewis had 14 and added 13 rebounds, Kivinski had 13 and Most and Heinen had 10 each. The scoring total for Most was a career high. Gabbie Miller added eight rebounds to help KWU to a 40-29 advantage on the boards. Wesleyan is back in action on Saturday at McPherson before returning home on Monday to face Southwestern. It wasn’t their best performance of the season, but it was good enough to get the job done. A.J. Range, James Brooks (JR/Cherokee, Kan.) and Nate Leach combined for 33 second-half points and Kansas Wesleyan turned in another solid defensive effort as the Coyotes pulled away the final 8 minutes for an 81-72 Kansas Conference victory over Sterling on Wednesday at Mabee Arena. KWU improves to 10-8 overall, 8-6 in conference play, while Sterling falls to 3-15 and 2-13. 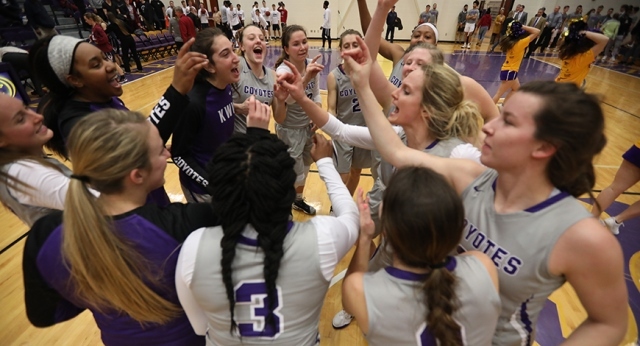 It was the Coyotes’ seventh consecutive victory over the Warriors and their fourth KCAC win in the last five games. Wesleyan appeared on the cusp of pulling away a couple of times, but Sterling stayed within striking distance by making 12 3-pointers and grabbing 15 offensive rebounds. The Coyotes led 31-23 with 2:50 left in the first half, but only had a 34-31 advantage at halftime. They pulled away to a 56-43 lead with 12:44 left in the game, but Sterling answered with a 9-0 run to get within 56-52 with 10:23 left. Sterling made one last charge and got within 61-57 on Isaac Ostrosky’s fourth 3-pointer with 8 minutes left, but Leach came off the bench and fueled an 18-8 run with all nine of his points as KWU pulled away to a 79-65 lead with 2 minutes left. Brooks scored 15 of his game-high 21 points the second half while Range had nine of his 13 points and 11 rebounds. Marquis Kraemer (SO/Aurora, Colo.) had another monstrous game, finishing with 13 points, seven rebounds and seven assists while battling foul problems. Wesleyan shot 48.4 percent from the field (30 of 62), including 10 of 21 from beyond the arc. Sterling shot 32.4 percent (23 of 71) and 32.4 percent from 3-point range (12 of 37). The Coyotes were 11 of 20 at the free throw line while Sterling was 14 of 16, but KWU easily won the rebounding battle 47-34, led by Jordan McNelly (JR/Salina, Kan,), who had 13 to go along with five points. The Coyotes had 17 offensive rebounds, 13 the second half, and an 18-10 advantage in second chance points for the game. Ostrosky and Edo Okafor led the Warriors with 12 points apiece. As for the fatigue, factor Monson said the team will take a break before preparing for Saturday’s game at McPherson. The Coyotes play three games next week – Monday against No. 10 Southwestern in Mabee Arena, then road games Thursday vs. Avila in Kansas City, Mo., and Saturday against Saint Mary in Leavenworth. The Coyotes lost to McPherson 79-77 Nov. 26 at Mabee Arena on a last-second layup by Chamaje Barideaux. KWU led 45-33 at halftime.